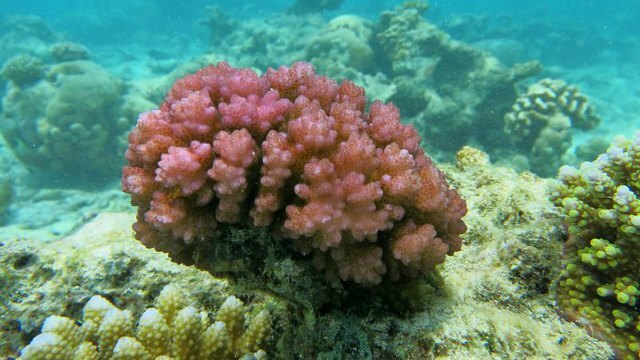 Soluble adenylyl cyclase measures and responds to pH changes in coral cells, but whether it can help the animals withstand ocean acidification is not yet known. WIKIMEDIA, AHMED ABDUL RAHMANResearchers have identified an enzyme that helps corals keep a steady pH in their cells, even as the acidity changes in their environments. Corals experience pH variation due to fluctuations in cellular metabolism, the differing pH needs of various parts of the coral polyp, and even the changing acidity of the ocean itself. The enzyme, soluble adenylyl cyclase (sAC), produces cyclic AMP (cAMP), a signaling molecule that researchers suspect triggers further chemical reactions to raise or lower cellular pH as needed. Whether sAC can help corals withstand the ocean acidification that accompanies global climate change remains to be determined. The results appear today (November 1) in Proceedings of the Royal Society B. Most studies of sAC in mammals have measured extracellular pH, says Jung-Chin Chang, who studies sAC’s role in the liver disease primary biliary cholangitis at Amsterdam’s Academic Medical Center and was not involved in the work. The present study, in contrast, investigates sAC’s role in regulating intracellular pH. Two aspects of coral metabolism, in particular, change intracellular pH: cellular respiration and photosynthesis, performed by endosymbiotic algae that live within some coral cells. In respiration, cells use oxygen to break down carbohydrates and generate cellular fuel, producing carbon dioxide (CO2) as a waste product. CO2 then reacts with water to form carbonic acid, thereby making cells more acidic. “Cells are little acidification factories,” says Chris Langdon, a coral biologist at the University of Miami in Florida who was not involved in the work. “Every cell needs the ability to regulate its pH and to trigger a mechanism to elevate the pH if it senses that it’s going down,” he adds. On the other hand, when symbiotic algal cells consume CO2 to produce hydrocarbons through photosynthesis, their host coral cells lose carbonic acid and the intracellular pH of the host cells becomes more basic. Coral cells encounter varying external pH environments around different parts of the coral polyp. For example, the pH of the coelenteron, the cavity in the center of the coral polyp into which other cells excrete acids, can be as low as 6.6, so cells bordering it must be able to withstand that acidity. 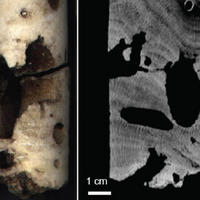 In contrast, cells involved in calcification, near the coral skeleton, are exposed to fluid with a basic pH, ranging from 8.65 to 10.0, Tresguerres says. The lab of Jochen Buck and Lonny Levin at Weill Cornell Medical College in New York reported the presence of sAC in mammals in 1999 and have investigated its functions, mostly in mammals, ever since. Tresguerres, who did his post-doc in the Buck/Levin lab, decided to study sAC in aquatic animals. After finding sAC orthologs in coral genomic databases, Tresguerres and his team at Scripps tested corals for sAC activity—namely, the production of cAMP—and found that cAMP production was hindered by the sAC inhibitor KH7. Yet in that study, reported in 2013, they did not identify the sAC gene in the corals themselves or prove that the protein it encoded was responsible for the cAMP production they had observed. In this latest project, Tresguerres and his team did just that, and also showed sAC is a pH regulator. The researchers took RNA samples from the colonial coral Pocillopora damicornis, generated cDNA, and identified the sAC sequence within it. They identified several splice variants of the sAC mRNA and created an anti-sAC antibody that they then applied to search for sAC in sectioned coral tissues. 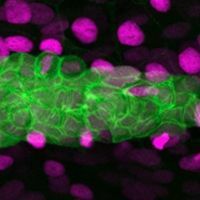 sAC turned up in diverse cell types, including cells with and without algal symbionts, cells associated with the coral skeleton, and cells lining the coelenteron. 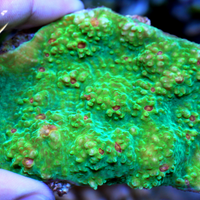 In isolated coral cells, the researchers then found that sAC influenced pH. Cells containing photosynthetic algae grew more basic when researchers exposed them to light, stimulating photosynthesis and CO2 consumption. That light-induced pH increase was smaller in cells treated with the sAC inhibitors. The researchers could have strengthened their results by repeating their experiments in the presence of an sAC activator, such as bicarbonate, Chang suggests. 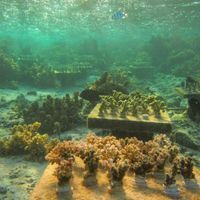 To see how corals might withstand changes in extracellular pH, the researchers exposed cells to seawater that they had acidified from its usual pH of 8.1 to 7.4, mimicking the pH of the coelenteron and the conditions of the cells that border that cavity. Cells with functioning sAC experienced a small drop in pH after 15 minutes’ exposure, but after an hour they rebounded, even surpassing their original pH. The KH7-treated cells, however, suffered a larger pH dip and did not rebound. “This substance that they’ve identified is critical to the ability of these cells to regulate their internal pH,” Langdon says. Can sAC protect corals from ocean acidification? In addition to the CO2—and, therefore, carbonic acid—resulting from respiration, corals face another acid source: CO2 in the ocean. As atmospheric CO2 levels rise, more of the gas dissolves in the ocean, and seawater becomes more acidic. The experiment that intended to simulate conditions in the coelenteron hints at how these corals might cope under ocean acidification conditions, but Tresguerres notes that the acidification experiments used hydrochloric acid, not carbonic acid or CO2, to acidify the seawater, so in that way, it differed from ocean acidification conditions. “Even though they are not exactly like ocean acidification because we did not acidify with carbon dioxide, our treatment resulted in conditions that were more extreme to what ocean acidification is predicted to be in 100 years,” he adds. “In order to relate this to ocean acidification, they would have needed to hold these, have some cells that were held under reduced pH for weeks, maybe, or even longer and then see what happens,” says Langdon. K.L. Barott et al., “Identification of a molecular pH sensor in coral,” Proc. R. Soc. B, doi:10.1098/rspb.2017.1769, 2017. Correction (November 1): We originally stated that the antibody helped identify sAC transcripts, rather than sAC. The Scientist regrets the error.